The creation of a functional heart and lung bypass machine in the early 1950s was a milestone in the history of heart surgery. Prior to WWI, the average survival rate for heart operations was less than forty percent. Twentieth-century technological innovations such as the invention of x-ray machines, the discovery of anti-coagulants, and the advent of antibiotics, have all contributed to the advancement of modern cardiac medicine. In 1932, during his Harvard fellowship, American surgeon John Gibbon began constructing a machine capable of artificially circulating and oxygenating a patient’s blood; he believed it would allow surgeons sufficient time to repair a damaged heart muscle. Following WWII, Gibbon became Director of Surgical Research at Jefferson College, where he shared research and collaborated with surgical residents and engineers to perfect his sophisticated heart-lung machine. These researchers faced the challenge of circulating blood at a safe speed, pressure, and temperature, while preventing lethal air bubbles and clotting. Five hospitals across North America each began devising their own heart-lung machine using various oxygenation methods; however, beyond Gibbon’s design only Dr. C.W. Lillehei from the University of Minnesota had any success. Lillehei’s machine linked the circulatory system of the patient with another volunteer in a cross-circulation technique. Gibbon, working with IBM, developed his Model II, which he used in May of 1953 in the first successful open-heart surgery in history. By the late 1950s several manufacturers were designing and producing heart-lung machines. The machine pictured here was manufactured in England by New Electronic Products Ltd. in 1958 and was purchased by Kingston General Hospital in that same year; however, concerns over the oxygenator delayed its immediate implementation. Canadian engineer Fred Siemonsen devised a new oxygenator in 1959, and the machine was put into service in January of 1960. At less than half the size of the standard machines of the day, the new oxygenator was more efficiently sterilized and could thus be more quickly reused. 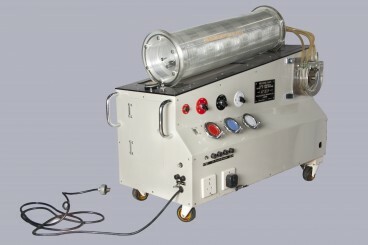 Alongside improvements in surgical techniques, the heart-lung machine allowed for exploration of the heart like never before. Today, in-procedure mortality is less than 5%, and nearly 70% of patients resume a full lifestyle after the operation. Thanks to the innovative work of Dr. Gibbon and those who came after, open heart surgery is now a common procedure worldwide. 1. Alexi-Meskishvili, Vladimir. Suturing of Penetrating Wounds to the Heart in the Nineteenth Century: The Beginnings of Heart Surgery. The Annals of Thoracic Surgery, Volume 92, Issue 5, Nov 2011. http://journals1.scholarsportal.info.proxy.queensu.ca/show_html.